Brad did a research paper back in his college days called “The Metabolic Effects of Short Periods of Fasting in humans and its Potential Application in Weight Loss.” And his ESE program presents those findings in an easy to read version of that research paper. While many users of this program talk about their success on weight loss, I have one more benefit to report. My bloating problem has been bothering me less and less. I must say I’m 90% recovered after practicing intermittent fasting. That’s why I mention about Eat Stop Eat quite often in this website. I think it’s time I should tell you more about this book and why I encourage YOU to read it as well. Studies show that eating every 3 hours doesn’t increase your metabolism. Less frequent meals or short term fasting doesn’t decrease your metabolism neither. Fasting can actually boost your metabolism during the first 36 hours. But that was not the only reason I go fasting. For years I ate unhealthily – ate on time three meals a day, Monday through Sunday – regardless I was hungry or not. I thought I developed my bloating problem that way. After 17 years of painful unhealthy eating, I came to a point where I preferred to live in a more pleasurable way. Without being a slave of food, I regain my freedom after practicing intermittent fasting. I started to enjoy the real taste of foods. Guess what. Many people find a product, like it, buy it, try it and then write a review on it. How long do they actually stay with that product or program? In my case, I have been practicing intermittent fasting since 2006 and I’m going to do it for the rest of my life. I’m therefore here to share with you some of my thoughts about the ESE intermittent fasting program. Fasting and Weight Loss – Many books or experts see fasting only as a detox tool — advising fasting for up to 10 days or even longer — and didn’t consider the perspective of weight lifters. However ESE does. ESE is a downloadable eBook. It counts 90 pages and has the most up to date research about fasting, 46 references to be exact. Brad debunks myths on fasting, gives you all the benefits and explains exactly how to fast. Lose Fat/Weight. Fasting twice a week for 24h drops your calorie intake by 25%. It also boosts your fat burning hormones. Build Muscle. Fasting causes no muscle breakdown and doesn’t slow down your metabolism. Brad debunks both myths in ESE. Save Money. Fasting 2x a week means 8 days per month less food. Your monthly grocery bill will drop by about 20%. Increase Productivity. No cooking, no eating, no need to worry about food on your fasting days. Increase Energy Levels. You won’t feel tired or lethargic or weak at the gym. Brad suggests 1 or 2x 24h fasts per week. I go slightly beyond this and do averagely three. But it is only my personal preference because I don’t really need that much food. I haven’t experienced any strength deficit. I even feel stronger after exercising in a fasted state. As I don’t eat lunch, I have a habit of swimming over lunch hour even on cool winter days. Very often I felt freezing on my way to the pool but pretty warm on my way back to work. In terms of weight loss, I shed 20 pounds in about six months. The beauty of the ESE program is that I don’t have to worry about overweight again. Throughout the years of intermittent fasting, I didn’t gain extra weight even after festival or long weekends crazy eating. I save money on my food bill. So I can have a luxury treat, say Kaiseki, occasionally as my fasting bonus. 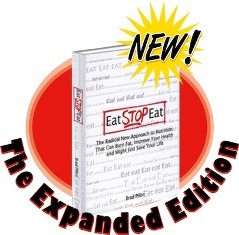 The New Expanded Edition of Eat Stop Eat remains at $39.95. I’m glad that Brad didn’t raise the price. There is also an Ultimate Package which you’d normally pay over $152. But if you buy through the link below, you’ll only pay $67 and save over 70%. Eat Stop Eat - The 90 pages eBook in which Brad debunks the myths on fasting, explains the benefits and will teach you exactly how to fast. “Why Diets Stop Working + Transcripts” – The truth about the single biggest and most overlooked problem that will sabotage most weight loss programs. TODAY'S BONUS! "Eat Stop Eat Audio Book"
"Expert Interrogations of Eat Stop Eat"
Click here to get the Ultimate Eat Stop Eat package today at $67. Eat Stop Eat comes with an 8-week risk free money-back guarantee. If you don’t like it, contact Brad and you’ll get your full money back. I’m confident, however, that you’ll like the information in Eat Stop Eat.